Rowan’s Creek Bourbon is a sleeper. I have had this stuff on the shelf for months and haven’t really had anyone ask for it. In fact, this is one of the last Bourbons on Dish on Market’s Wall of Bourbon that I tried. Not sure why, but it never jumped out at me. But, little did I know, I was sitting on a gem. Rowan’s Creek gets its name from a creek that actually runs through the grounds of the Willet Distillery – part of the Kentucky Bourbon Trail’s “craft tour” of artisan distilleries. Since I know you all love history as much as we do, Willett Distilling Company was one of the first to come roaring back on the scene in 1933 following the end of that God awful period of American history that we call Prohibition. A. Lambert Willett, the 15 year old son of John David Willett, used his father’s bourbon recipe and business acumen to purchase a farm and, together with his sons, founded the Willett Distilling Company on the site that is still home to the distillery today. The nose of this whiskey has a really strong alcohol scent, even after letting it sit for a few minutes before the first smell. It is really uncharacteristic of something that is 100.1 (!) proof. Usually I can get past the alcohol smell when writing a review or just talking about a whiskey, but this one was an elephant in the room. Hiding behind the alcohol scent was a little bit of caramel and butterscotch. When I first tasted it, another flavor replaced the alcohol scent. This time, the overwhelming fruity flavor of banana swept in and carried me to a long, sweet molasses finish. The flavor of corn is really prevalent in the finish, too which makes this a really sharp contrast to some of the rye whiskeys that are becoming more prevalent as winter creeps up on us. Don’t let Rowan’s Creek Bourbon sleep on your shelf like I did. If you are looking for something new to try, pick up a bottle. The uniqueness and polarity of the flavor makes this a good change of pace from the status quo. I give Rowan’s Creek bourbon an A-. How we grade our whiskey. The rarity of Rowan’s Creek bourbon propelled our grade into the A’s – many of you reading this wont be able to find a bottle unless you took a trip out here to Bourbon Country. This is a bourbon that you will want to buy a bottle of and keep it high on the shelf away from the greedy hands of casual drinkers. With the way the bourbon industry is going today, who knows – Rowan’s Creek bourbon could become an extinct relic in a world of garbage boutique and ultra-premium whiskeys. 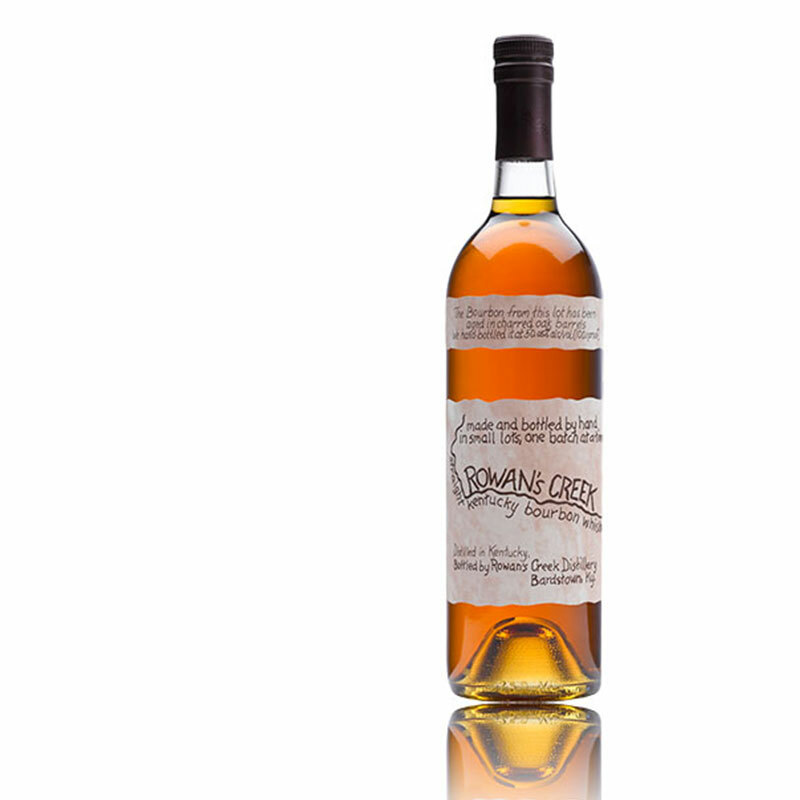 If you have tried Rowan’s Creek Bourbon, let us know what you think! Leave us a comment below and be sure to subscribe to keep up with all our latest reviews! Bourbon Trail – I liked Willett for the craft feel and Woodford for the beauty of the grounds and surrounding area. And…the bourbons at both places didn’t disapoint. What should be a decent price for this? I think I saw it for around $50 few months ago, didn’t buy. Also I looked all over the label and couldn’t find the age statement. I really enjoyed Rowan’s Creek. I received it as part of a ‘bourbon of the month club’ and was really happy that I did since it has such a smooth finish. I would definitely agree with your rating of A-. Really like this one, available here in the state of Wisconsin and is one I continue to go back to time after time. Cost in our area is approximately $35.00. If you’re able to find a bottle I’d recommend you pick up a bottle and enjoy.